I have True Image Home 2010 installed and making nightly backups. I installed Drive Monitor, but it cannot see the True Image backup files apparently, because it says "No recent backups have been made" for all drives, even though a backup is made each night for all drives (I have checked). What do I need to do to make Drive Monitor see the backups? The True Image log also shows the backups as successful. Welcome to our Forum, we're glad to greet you here! I completely understand your concern and will be glad to assist you. Unfortunately it's hard to say what exactly went wrong, so this sutiation requires investigation. Could you please provide us with the following information? Exact sequence of steps performed? It will show us logs and help to localize the issue. I contacted support about this issue already and they told me there was no support for Drive Monitor. They said the only support was through here. I had True Image 2009, I then upgraded to True Image 2010. I have been running daily backups for years with True Image. I downloaded and installed Drive Monitor a few weeks ago. Drive Monitor has never said there are any backups from the day I installed it. I have attached the Acronis info file. As silly as this will sound, have you double checked that DM is actually monitoring the correct partition for backups? If the text says 'enable' then counter intuitively the present state is actually disabled and the 'enable' needs to show 'disable'. I make backups of all my partitions. And yes, it says "disable" which would lead me to believe it is enabled. I take it noone else knows how to make Drive Monitor work correctly? What build of TI 2010 are you using? Any build prior to 7046 won't be recognised by ADM.
1. Images or file and folder backups that you make. 2. Are they scheduled or do you run them manually every night? Could you post a screen shot showing the disk and backup configuration in ADM? Does the rest of ADM appear to be working correctly? I have one other test, but I might have this confused with a right click menu context in 2011 beta - when I get home I'll check. One thing I forgot, have you tried re-installing ADM? Yes, these are backups made through TI 2010. Sometimes I run them manually, but usually they run scheduled nightly. Which configuration screen are you referring to? The rest of Drive Monitor appears to be working correctly. The reason I asked about images versus files and folders, is that I've only tested ADM against image backups, so don't know if a files and folder one might not show up. I don't understand the point of the attachment. I have monitoring enabled for the drives. So, Drive Monitor will only work for whole volume backups...? I don't understand the point of the attachment. I don't know, I only make images, it was just a thought. This is true - for now, Drive Monitor only monitors image backups. The thing is it is that in the software it is really difficult to make difference between "complete or almost complete" backups on the file level, and "just a few files out of the entire drive". Certainly, just because one backup of pictures folder was created, the entire drive can not be restored in case of disk failure. Thus, we only consider image backups as "good enough to recover the drive"
Just to note - my understanding is that nonstop backups are protecting the entire partition. However Drive Monitor does not seem to detect that I have this type of backup in place. I have just in the last week encountered the same problem. I have scheduled backups that run successfully every morning on all partitions doing a full image copy and retaining 5 versions of each partition. All partitions are monitored - i.e. show disable. All but one are reported as not having been backed up for a week. I let this run for a week to see if that would clear it but still have the problem. It started about the time I had to restore my C partition from a backup. This was fine. Yesterday I uninstalled and reinstalled ADM but the problem remains. I have used Drive Monitor with ATI for a couple years with no problems until a few months ago. I do incremental backups on three partitions once a week with a limit of five and an age of 30 days. I never used to get any "No recent backups" messages, but now all three partitions are reporting the same thing. Two of them say the last backup was a month ago and one says it was three months ago! I am using ATI Home 2012 Update 2 build 7119. I have uninstalled and reinstalled Drive Monitor and nothing has changed. Please help, I'm getting tired of seeing the warning message every time I boot my PC. I'm wondering if ADM or the latest builds actually 'know' about each other. For your information, the latest build of ADM and ATIH 2012 build 7133 don't seem to communicate properly at this point. I have a Windows 7 64 bit system with both products installed. (ADM after ATIH 2012), and I have two backup tasks. One is the System Reserved and OS partitions, and the second is a Data partition, all of which are on one physical drive. Both tasks have been run within 24 hours, and the Data task was updated today (differential). The ADM product for some reason sees the SR/OS backup task as complete and identifies the dates correctly, but does not see or recognize that the Data backup task has ever been run. 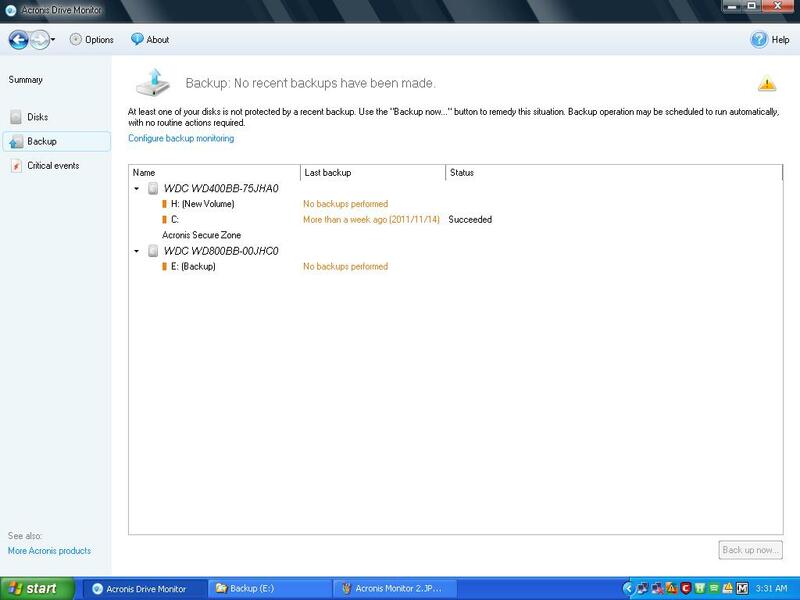 Both backup tasks store their respective backup files on the same external USB connected hard disk, but in two seperate folders. I have not tested ADM on other OS versions or other (recent) ATIH versions, but would expect similar inconsistent results since the ADM product has not been updated in a while. Backup H: No backup performed - But both partitions are backed up at the same time. Do you have to backup partitions separately to have them recognized by ADM ? Note: Running xp/pro SP3 and ancient version 8.0 of Acronis backup ! Tried installing ATIH 2012 on XP/Pro - but to no avail.